Capt. Stephen and deck hand Gary were great. They made the trip better by being pleasant and personable the whole time. Gary worked very hard to keep our lines all baited and the fish off and lines back in the water quickly as well as being very friendly. They took us to places where we could catch a lot of fish and coached us to get the most out of our experience. They were both very knowledgeable about the types of fish and were helpful in instructions on getting them cleaned and packaged for the trip home. I would definitely use Capt Ellis Charters again. 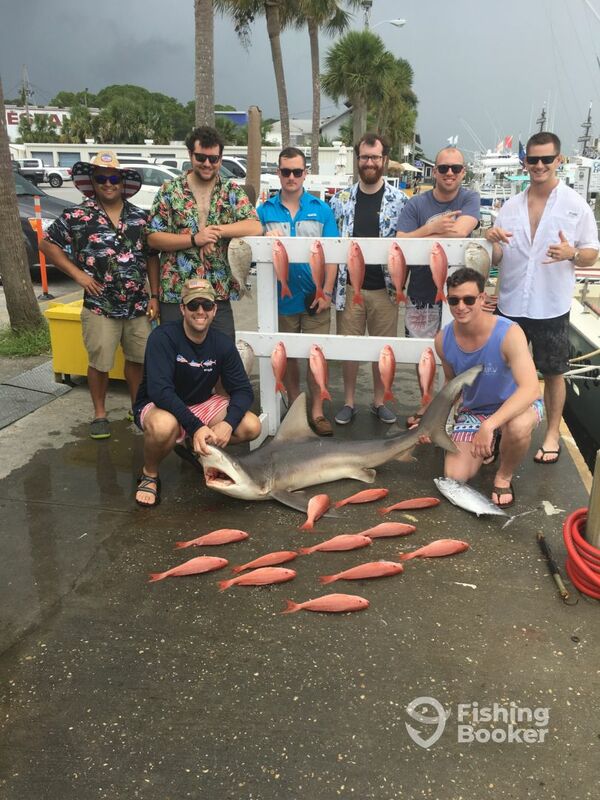 Had a great time on our half-day snapper outing. We left just after 5:30 AM and stopped to buy bait on the way out. 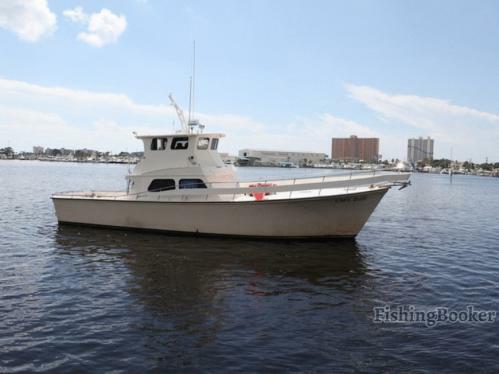 If you are bottom fishing for snapper, you’ll need to add another $40 to $50 for live bait on top of the trip cost. Drove for 2 hours out to the spot, then Captain Steve found the fish for us. Within the first 5 minutes we had already hooked an amazing grouper! For the next 2 hours it was intense bottom fishing. 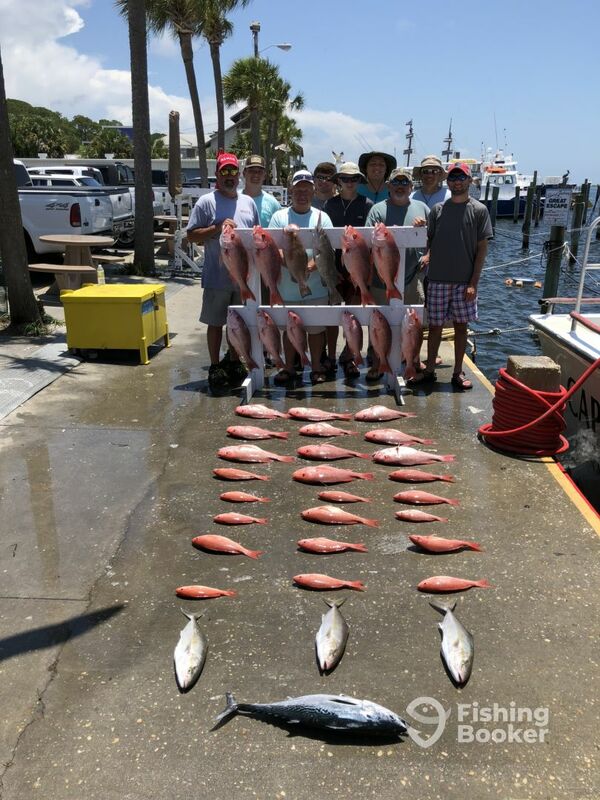 We caught our limit of red snapper and brought in a number of Vermillion snapper as well. 30 fish totaling 86 pounds in about 2 hours of fishing. In the last 30 minutes the dolphins found us and started taking our fish off the line. Then 2 hours back and it was all over. We had a party of 10 people fishing and we all had lines in the water. Captain and hand were fun and helpful. I would recommend. Captain Steve and mate Gary were very accommodating to my family and I. The guys did not waste anytime getting us fishing, while underway they had some trolling lines out that put a large Amberjack in the boat. The fishing was tough but Captain was able to put us on top of some snapper! When the fishing got hot Gary was able to keep all the lines fishing! The crew did an excellent job getting us underway and fishing early. 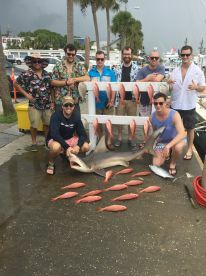 Unfortunately we missed red snapper season but we more than made up for it with the number of vermillion snapper and the 7’ long 120lb bull shark we managed to catch. All in all it was a great experience. We’ll be back soon! It was a good fishing trip. All nine of us caught numerous fish. We asked for Red Snapper and that’s what they put us on. 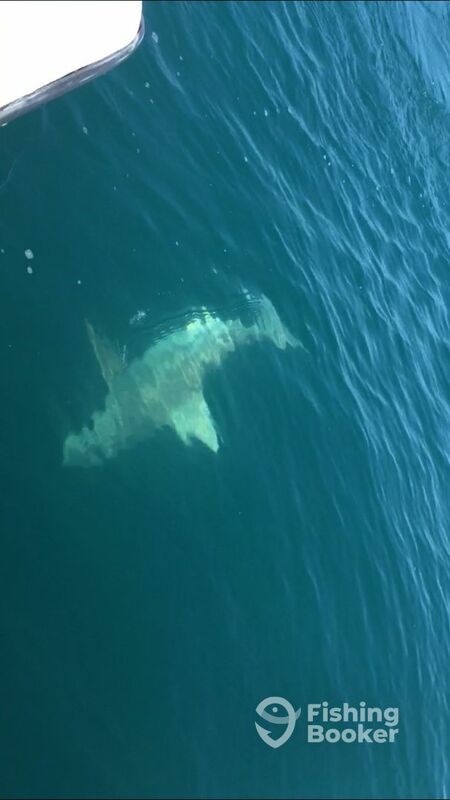 To top off the experience, one of the guys was able to reel in about a 10 foot shark up behind the boat before the line snapped.